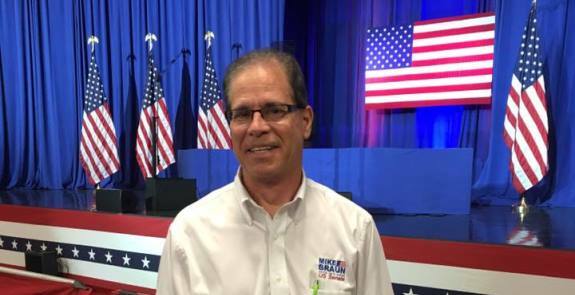 Another conservative outsider, successful businessman and conservative state Representative Mike Braun of Jasper, has announced he is entering a 2018 Indiana Republican Senate Primary. Braun is the founder and CEO of Meyer Distributing, a nationwide auto parts distribution company with locations in 38 states and headquartered in Jasper, Indiana. The Indiana Republican Senate Primary has already drawn interest from two incumbent Republican Congressman; Rep. Todd Rokita (IN-4) and Rep. Luke Messer (IN-6) who are both seeking the nomination to take on incumbent Democrat Senator Joe Donnelly of South Bend. Messer recently announced that he was running for the Senate seat, while Rokita has yet to formally say if he's running. Although, according to the South Bend Tribune, the two Republican congressmen have already begun to take rhetorical swipes at each other, including each accusing the other of being "unhinged." AP reports Braun correctly observing that the increasingly bitter feud between Messer and Rokita is turning off voters. He says harsh words between the two will only tear down the eventual Republican nominee and boost incumbent Democratic Senator Joe Donnelly's re-election chances. “Joe Donnelly has consistently voted with the liberals in Washington. Donnelly voted for Obamacare, Obama’s radical Supreme Court justices, trillions in reckless spending and debt, and stood with Barack Obama as he worked to destroy this country. Now he is standing with Nancy Pelosi and Chuck Schumer as they block President Trump’s efforts to bring real conservative change to Washington,” charged Braun. “I am ready to go to Washington to deliver Donald Trump reinforcements as he takes on the DC swamp. Last year’s presidential election showed that Hoosiers know outsiders with business experience are the country’s best hope to fix the broken political system in Washington. Most importantly, Hoosiers want leaders who can break the hold career politicians have on the system and make conservative change happen. It’s time to replace Joe Donnelly with a Hoosier conservative who can get the job done. That is what I will do in Washington,” Braun said. Braun, who has pledged to invest his own money to put his campaign on the same footing as the better-known Rokita and Messer is already emphasizing his outsider status. "Last year's presidential election showed that Hoosiers know outsiders with business experience are the country's best hope to fix the broken political system in Washington," Braun said in a statement. Braun has also placed himself squarely behind President Trump’s make America great again agenda, saying he pledged to help President Donald Trump "as he takes on the D.C. swamp" and incisively portraying Democratic incumbent Senator Joe Donnelly as an ally of liberals in Congress. Rokita, an Indiana establishment favorite and Messer a former staffer to conservative stalwart David McIntosh enter the race with certain advantages, however, in an atmosphere were incumbency automatically associates one with the failed Capitol Hill Republican establishment, it is hard to gauge whether being in Congress will hurt them or help them. Mike Braun is a smart guy and successful businessman who spent the summer gauging interest among the Hoosier state’s grassroots Republicans. He’s got the resources to be competitive and he’s clearly taken the lay of the political landscape and determined there’s a hole in the marketplace for an outsider candidate. He will be a formidable candidate if he can stay the course of pushing the Trump MAGA agenda, while avoiding a mudwrestling match with Rokita and Messer. To learn more about Mike Braun’s campaign for the Senate click this link. CHQ Editor George Rasley is a veteran of over 300 political campaigns. He served on the staff of Vice President Dan Quayle, on the staff of Robert D. Orr, late Governor of Indiana, on the staff of the Indiana General Assembly and in various positions in the Republican Party of Indiana.